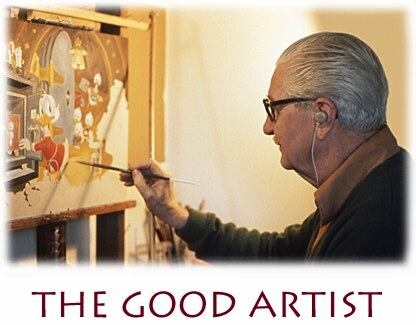 The Good Artist at his easel. with James Lowe and Joseph Cowles at kjagradio.com, 18 January 2012. Enjoy! into tiny comic book panels? PDF files not loading or not loading fast enough? Click this link for your latest Free Adobe Reader Download. Use your back button to return to the Home Page. Disney characters are owned and copyrighted by Disney and are shown here for educational purposes only.